From pre-school to higher education we have been both officially and unofficially held to expected outcomes by our communities who uphold the value of education. Throughout the ages of school improvement it has always been an inherent mission for schools is to educate students to be better than they were. When asking this question of being better than they were or can we truthfully measure our outcomes to measure our school attenders and employees that they are succeeding to achieve at their true potential. When we walk the halls and view classrooms or sit in on an online course what is the measure that the teacher is reaching their full potential or are the students being an realizing an opportunity to move closer to their potential? Schools have often accepted redundant teaching methods over the years and produced lesson plans that have been the same way for many years. When our student audience has changed over the years our teaching approaches now needed to adapt to the learning styles and values of our society. It is a proven fact that giving grades for our students is without a doubt is a very subjective measure to predict and show competencies accomplished. Very little is measured from a skills perspective for skill in a competency at the conclusion of any term. We can extend this weakness to how we give opportunities for the educators to improve their potential by improving instruction. The measures of instruction fit into the same class as our student measures which is very subjective. As we look at these glaring facts our schools at all levels of for-profit, non-profit, private and sectarian are influenced by government regulations focusing on these old outdated forms of measurement. Our states are using standardized testing for measuring the success of their resident students. When we should be looking for improvement, we are looking at a standards established for only those that could meet the artificial targets. Improvement starts with a baseline and a build from there. I am sure many of you remember the movie “Money Ball” with Brad Pitt as the general manager of a professional baseball team. This was a story of an actual team who relied on results to improve the team outcomes with success. The data were pointed at the key targets to make baseline improvement of the team. Measurement dictates a process for improving outcomes. The baseball team proceeded to an ultimate outcome of success. If we can use the premise of process by using data we too can have success in our schools. Schools and colleges making these adjustments will offer to all their stakeholders visible growth by allowing for participants to move to higher potentials. By making these process changes outcomes are not subjective but measuring validated targets after the improvement of learning. If you have any interest in making this change I have the process used now for eight years that makes the data work for you. Process is key to success in any organization. Process was the key to improving industry by a famous industrial consultant who rebuilt Japan after World War II. Dr. Edward Deming. Surprisingly Schools have not did much to capitalize on this process. Research coming forth now may change this practice in our academic centers. It is certain that by establishing the correct target by using data and analytics with schools in any environment or culture can improve. GRCARLSON INC. are here to help you make the transition. Process in action with coaching for faculty, teacher and instructor improvement. How Can Your School Improve Through a Proven Process? The ultimate goal for any business or school is to satisfy its mission and purpose and improve from its current achievements to higher levels. There is no question our school business is a people oriented business for both our internal and external customers. The U.S. government is redefining the consumer protection for themselves as a responsible governing body for schools. Schools now are approaching the necessity to meet consumer student demands. Accountability for student satisfaction and student success outcomes are reviewed from a granular aspect providing proof of success. Schools producing anything less than measured acceptable success levels of student success, student retention, completion and employment will face often harsh remedies. During the last few months we have seen schools both closed and compromised by not responding to these very evident changes. Essentially schools who rely on their old laurels may be in jeopardy. Outcomes and evidence of achievements in schools are a responsibility for schools to be transparent on their success. The communications need to be defendable and not self-reporting. A process of reporting requires an ethical and compliant formula of data analysis that will be viewed by officials and public. Outcomes will determine the longevity of any program to continue. Your ability to accurately be informed with not only the big picture of the programs results but to be capable of breaking down success of curriculum, materials, equipment and teaching styles. We can quickly see the earlier the results can be reviewed the recovery period can begin. Outcomes can be separated into three areas. Each area has its’ own necessary plan of actions. Outcomes can be acceptable, non-acceptable and exceeds expectations. Revealing the outcomes from target goals to actuals will set a plan into motion for all three areas. Our actions have often worked on only those that have not met target expectations. This process often will only substantiate mediocrity. Ideally we need to uplift all the performance, no matter what category they were reported. A process needs to be universally accepted and has equity reporting of results. Target measures are fairly applied to all the stakeholders. Measures need to be built upon history of past experiences. So much time in traditional schools we have spent on the content. Theory, labs, materials, equipment, teacher and student that made up the structure of the classroom. In the last fifteen years the walls of our classrooms have come down. Our focus was content which I call the what for a classroom. The pieces to the course puzzle were predominantly content. Stagnant content does not give way to the reality of the diversity of our students who consume the content. Content alone does not cause for equity in learning behaviors of the students. One variable of being the change agent for success becomes the teacher. The who is the important tool of how all this will work with the diversity of learning. Our person who is the who which will determine the how content and style will be communicated in the best possible environment. As we look back at the schools with the three who’s of acceptable non-acceptable and exceeds expectations they all become part of the plan for school improvement. All successful organizations exists on team and coaching. An atmosphere that breeds a willingness to have those who want and desire an improvement plan to continue to grow. These are the professionals that keep educating themselves by exhibiting an acceptance of gratitude to those who help them become successful. Practically where do we start on this type of process to fulfil this juncture towards a successful school with successful people? Our discovery path starts with each person who makes a difference in the outcomes. It is easy to ascertain the person is the teacher. Even our good schools can move from their current state to better. Process needs to be cyclical and not linear. Good practices need to re-occur to build on growth and sustain success for the future. The flow chart below gives you and idea of how these foundation activities will increase the chances of success. Collecting data only and not being capable of analyzing the result keeps us from understanding our outcomes and practices. Outcomes are a result of a starting point and a measuring point. Measured against an acceptable equitable target point we can begin plans of improvement. Targets gives clear and defendable expectations for all the individuals who are team members in the program. The outcome data gives each person knowledge of where they would like to be or are there. When we can take history of outcomes with the variables needed to be measured and create a mean score of how everyone has done in the past will establish a benchmark. It is necessary to keep these cohort measuring periods in the same time calculations to experience school improvement in performance. Three years of data validates its value to create benchmarks. Every course and every program will be in the current measuring time period to view both individual growth, course and program. As expectations grow with higher attainments the performing curves begin to change. Schools who have put the process into place at all levels have experienced student retention, attendance and success. The level of the functioning school will always have potential of growth in measured outcomes. The benchmarks change as the school improves from its own averages. Each school becomets there own change agents of success. School reports created from this process becomes meaningful with action plans derived from discussions between the participants for growth activities. Professional development is an outgrowth of the individual meetings and recognizing those who have exceeded expectations communicating their styles and techniques. These activities produces a new value added for students, performance of students is higher, provides for better teacher synergy, better student retention, student completion, attendance improved, student satisfaction improved, teacher satisfaction improved and competencies of students and teachers reach higher levels. A known process that has a professional component that works with a diagnosis and plan of treatment. The plans have resulted in teacher mentor programs, teacher shadowing, recognition of outstanding performers, on boarding new teachers, teacher training programs, curriculum review and improvement and scheduled program reviews and refresh. Professionals are granted quality time to have meaningful discussions and individualized support. Challenges now become more reachable and reasonable. The school mission is shared by everyone. Attitudes revolve around empathy and caring. Over the past eight years it has been a pleasure to assist schools in putting this process in place. It is not hard to understand how this places a solid foundation of success that can be substantiated for schools. Under the guise of the Better Business Bureau we have achieved a purpose that would surpass any review by a consumer protection oversite. This program is the one which considers internal and external customers. Leadership in the schools makes the difference. Progress is governed by the willingness to support your professionals with the appropriate support. The success for the future of your schools relies on the ability to adapt to a new world of education content, students and governance. Let this process help your transitions. GRCARLSON INC. is a full service corporation to serve your school or college in any one of your functional areas or all. The services your schools or colleges provide are key functions that rely on each other for student satisfaction. We have joined together a group of professionals who can raise the performance in any of these services. Performance of your institution is the measure for your students, parents, employers and regulatory organizations who evaluate their experiences. Our professionals are available to engage with your schools in any capacity. Our strategic plan to support your schools or colleges would be by one or more of these actions: project work, advisory support, hourly work rates or monthly retainer charges. It is our goal to work within your financial budget to best improve your schools outcomes for all of its operations. Our team members will use any of the following techniques or methods for training your staff: work on site and/or use social media by training through webcast with hardcopy submissions to your schools. You will be assigned one key person to be your spokesperson from our team to use all the professionals at GCARLSON INC. We will be happy to set up a webcast for your school at no cost to answer your questions regarding the expert services we would offer to your schools or colleges who may have an interest in GRCARLSON INC. Please take advantage of this opportunity for a webcast at no cost to you. No matter what accreditation organization you are a member of the regulatory environment is changing for all of the schools. Regulatory requirements are evolving into a more comprehensive look into the entire school operations. It is essential to schools and colleges they are prepared for what is coming in the near future. What is happening with my accreditation organization? What does the future look like for our schools and colleges? How does government regulatory directions influence and change expectations for a school or college? How do I prepare for an initial or re-accreditation with an accreditation organization? How do we increase student success, graduation rates, employment rates, student retention, and student attendance? How to partner with recruitment services that will provide compliance and verification to new student starts? Linking School Administration, Academics, Financial Aid, Recruitment and Career Services? How to develop strategies for creation and implementation of new programs? How to hire the best people for your school? What professional development would be beneficiary to my professional staff to improve their performance? How to improve student satisfaction? From what we have seen in the last few weeks is that if any of these functions have compliance or performance issues, it may mean concern for your school. We are ready to help schools thrive again with success. We need to close the gaps. If you have any interest just give us a call to talk about your thoughts and concerns. It will be the best call you make at this time for our schools future. Santa Barbara Business College: Bakersfield, Rancho Mirage, Santa Barbara, Santa Maria, Ventura and Online. Harrison Colleges: Eleven campuses in Indiana; one campus in Morrisville, NC and one campus in Grove City, OH. Ohio, Virginia, Michigan, Indiana, Missouri, Florida, Kentucky (Secondary School Guidance Counselors), Career College Association, ACICS, APSCU, and twelve years for the Leadership Institute sponsored by CCA and APSCU. These experiences have been rewarding and productive to the schools we have served. How your school or college can improve! Great schools all look to improve their students lives through an education that is meaningful.Over the years individuals and companies have focused on the singular approach towards retention and success. These programs required training of those to know how to implement improvement practices in the school. If you are reading this as a school executive or faculty member I know you can remember these training programs. Topics were to identify students at risk, learning styles, higher empathy, improvement of student self-image and soft skills. How did your training sessions work? Did you have a one, two or three day session and then buy the materials to complete the seminar? Writing this is not to critique or knock on these programs but you have to ask yourselves how you have sustained the excitement and program continuation. What are the practices that make the program work a life time. Programs in education often are linear. We present practice with a training. If you were to look at the attendance of the members attending and how many are still working in the school in one year, two years or three years later. Little has been done to refresh ongoing practitioners and new employees. New employees often wait until the new training takes place. This is just enough time to possibly lose students before training takes place. Success in the school takes place often right after the training. The “Hawthorne Effect” (When individuals realize they are being observed with a new practice the novelty creates a temporary increase in performance) is when experiences by all of us in our developments and projects with short-term training may have limited time value. Intentions were admirable when we were all looking for the “magic switch”. Solutions to our plight lie in the type of activities that change behavior which has support for lasting success. 1. Our capabilities today allow us to recall history of performances by selecting data from programs, courses and institutions. 2. From our data collection we can do a complete data analysis to make appropriate and equitable conclusions. 3. Our analysis gives a proper perspective to create a plan for improvement. This plan becomes an individual plan of improvement for each member of your staff. 4. It is much easier to successfully obtain a transfer of ownership to each individual when it is equitable and fair with supportive intent. 5. When support is put into practice each individual can execute a plan to improve. 6. 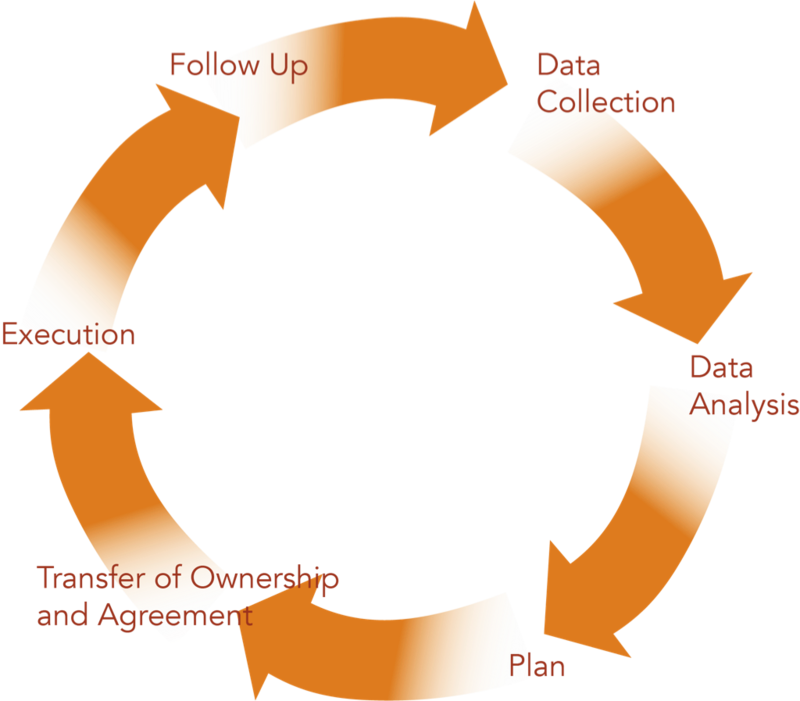 Cyclical reoccurrence creates follow/up to review new data and complete an analysis for improvement. To maintain success plans need to acquire a self-sustaining and cyclical nature. Success in companies, sports and schools is from a process. Connecting the six steps above with a process builds a foundation that is maintained as long as you repeat the process in your school. It is time to build a foundation to create higher success levels for faculty, meet compliance expectations, higher graduation rates and student satisfaction improvement. Stop your linear training and create a process that becomes part of the business practice in your school. Professional development becomes a reality with individual practicality. If you have an interest on how to accomplish these successes in your school please contact me and I will share.